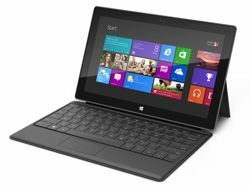 Microsoft Surface RT tablet UK prices confirmed | What Hi-Fi? Our sister site Stuff.tv was in New York for the Microsoft Surface launch. Check out their first hands-on impressions now. It has been a busy week for Microsoft. After the Xbox Music announcement, the software giant has announced its pricing plans for its upcoming Surface and Surface RT tablets. Launching on the 26th of October, the Surface is now available for pre-orders in various territories (including the UK). The entry-level 32GB model starts at £399, without the Touch Cover. The same model with a default black touch-cover weighs in at £479. The 64GB model with a black touch-cover is priced at £559. The Touch Cover, which comes in a variety of colours (black, white or cyan) costs £99. Additionally the type-cover/physical keyboard can be bought separately but will set you back £109. So far Microsoft has only detailed pricing plans for its Windows RT version declining to reveal the pricing for its Intel-based Surface device with Windows 8 Pro OS. Aiming to challenge the dominance of the iPad in the high-end tablet market. The Surface RT tablet arrives with a 16:9 widescreen, 10.6in screen with a 1366 x 768 screen resolution. There's Bluetooth 4.0 support, two 720p HD cameras (front and back), 2GB RAM and an accelerometer and gyroscope. Microsoft Office Home and Student 2013 are shipped as standard and there's a microSD card slot for additional storage, too. The Surface RT is available to pre-order from the Microsoft store now, while further details on the Surface Windows 8 Pro models are expected in due course.